Scorpions are bugs found to be relative family to spiders and ticks. Scorpions have lived for millions of years and can adjust to surviving in almost an area. From mountaintops of the Himalayas to jungle living in Brazil, Scorpions withstand cold and hot environments. There are thousands of scorpions found throughout the world but not all of them are deadly. Some only possess poison strong enough to kill their prey, while others may contain enough poison to kill a human being. Scorpions can adapt or modify these poisons based on the threat level found in specific environments and prey. The prey usually consists of other insects, although it may again vary on environment. Some scorpions may go several weeks or months without the possibility of finding more prey. This makes the scorpion modify its eating pattern. They can slow their metabolism rate enough to survive from as little as one insect per year if necessary. Even at this rate scorpions remain very fast and able to catch prey. Although scorpions have adjusted to living in these environments, some without regular eating patterns, scorpions have not adjusted to living on land with no soil. They must be able to burrow, whether in grassy areas, or sand, they will not survive in areas without that protection. The most dangerous and poisonous scorpion in Arizona is the bark scorpion, also known as crevice scorpion. These types of scorpions appear to be pale in color and hard to see. They are commonly found in their habitat in rocky areas and able climbers. Bark scorpions are an exception, while all of the other scorpions are solitary in nature. This scorpion can congregate between twenty to thirty. The venom in the bark scorpions can cause a lot of pain. So watch out for these little creatures. Are you noticing scorpions in or around your home? Do you have a scorpion infestation in your home? Want to keep scorpions away? Contact Varsity Termite and Pest Control today! 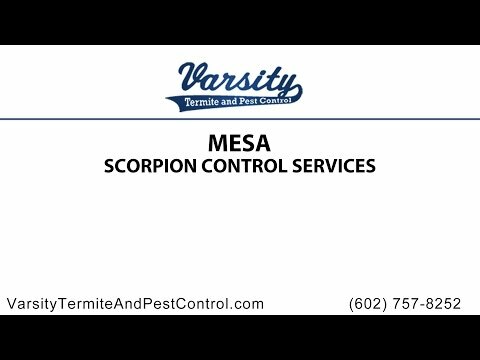 Their profession team on scorpion exterminators in Mesa are here to help you in need! Our goal is to prevent scorpions from coming back into your home leaving you completely safe and comfortable to be in your home again. Your safety is what really matters to us. If you have any questions or concerns about scorpion control, please give us a call you we will provide you with all the information you need.